A small Mediterranean island that is for a big part still untouched, which is rocky, and filled with beautiful nature. The Porquerolles island, a natural reserve area, lies peacefully just off the coast in the South of France along the CÃ´te d’Azur, next to two smaller islands. The island greets you from a far distance with his rocky shores, but by coming closer you realize it is not totally untouched. A small village and harbor welcome the visitor upon arrival. Obviously, only by boat one can arrive, and a ferry brings you here in twenty minutes from the nearby harbor in La Tour Fondue. Walking on the island of Porquerolles is like walking on mountain-tops. 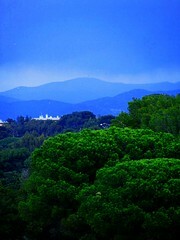 Porquerolles consists of a series of mountain peaks that became island when the sea level lowered. And as such, it was a perfect hide-out for pirates in the middle-ages, a private resort for a wealthy Belgium engineer in the 1930’s and as a French fortification. Things changed for the status of the island in the 1970’s when two-thirds of the island were bought by the French State and the island was turned into what it still is today: a natural reserve area. Now it is one of the last remaining spots on the French Riviera or CÃ´te d’Azur which is unspoiled and with intact and wild nature. The remaining parts of the island still belong to the village with just over 300 inhabitants but the village forms an integral part of the island as a whole. In the summer over 3000 people visit the island on a daily basis. They come for a day, or for some more days and they stay in one of the small hotels on the islands. Many explore the island by bike – they are for rent on the island – or the visitors come for a nice stay on one of the sandy and beautiful beaches. It only takes an hour or two for a tour around the island by bike. A tour around the island will definitely bring many surprises. The flora and fauna is very diverse, from different types of wild flowers to many trees of different types. Snakes, other reptiles and different bird-types can be seen or heard. There is also a wine-yard, and fields full of flowers. Porquerolles is not the only island around but the only one that one could visit by ferry in the end of March. The island of Port-Cros (Ile de Port-Cros) and the Levant Island (Ile du Levant) are part of the same mountain-peak formation but by ferry you can only reach these island during summer-time. Together, the Island are also called the Iles d’Or (the Golden Islands). Wikipedia in German and in French. The photo’s in this articles and more that I took on this island and around the French coast, can be found in this CÃ´te d’Azur Set.